Almost always working in series, Ruff frequently develops new technologies to facilitate concepts that are at the edge of visual and technical vanguards. The German photographer Thomas Ruff is the anomalous schoolchild of the Dusseldorf Art Academy and Bernd and Hilla Becher’s tutelage. Breaking and reinventing the rules of photography for over three decades, his body of work remains peerless in its insight, diversity and envelope pushing tactics. Two new projects at David Zwirner, photograms and ma.r.s., extend Ruff’s flair for innovation, and his mining of photography’s past to reveal its future. Almost always working in series, Ruff frequently develops new technologies to facilitate concepts that are at the edge of visual and technical vanguards. ma.r.s. 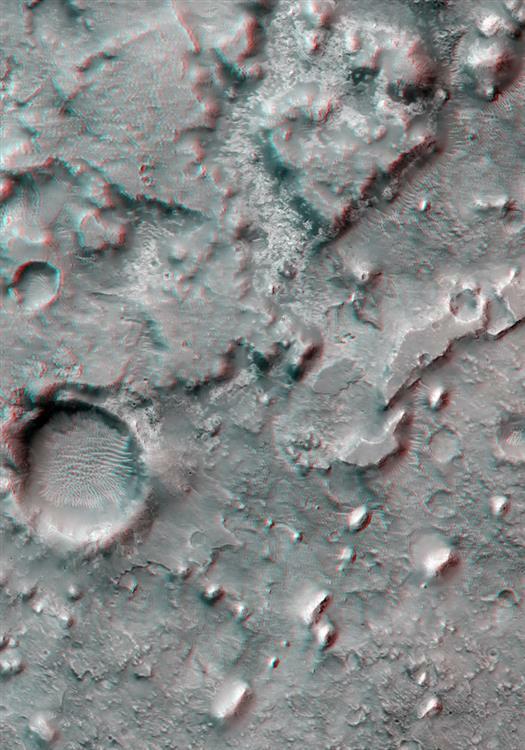 (stands for “Mars Reconnaissance Survey”) is a series of images based on surface depictions of the fourth planet, taken by a high-resolution camera on an orbiting NASA satellite. 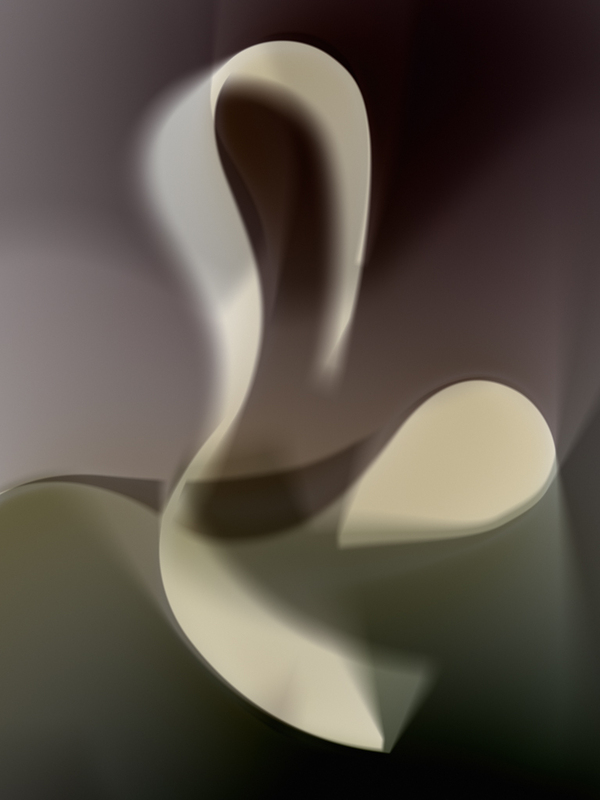 Ruff downloads these images from the web and then performs desired alterations of color, orientation, and perspective. The results are monumental landscapes, which are simultaneously familiar and alien. 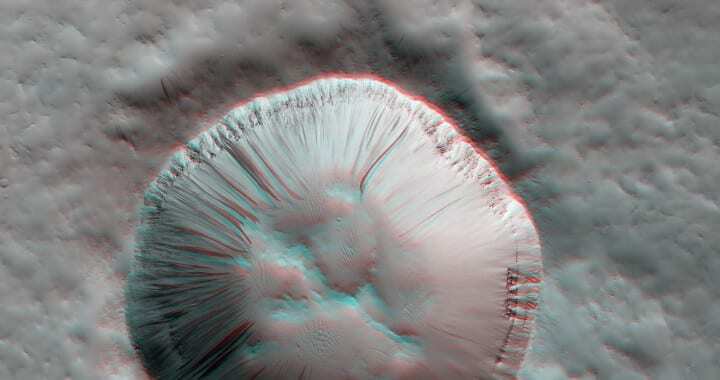 Some are also stereoscopically enhanced – with the aid of 3D glasses – to vividly render the planet’s heavily cratered topography. The effect is novel and surprisingly vivid, though like anything 3D, a suspension of disbelief is mandatory. 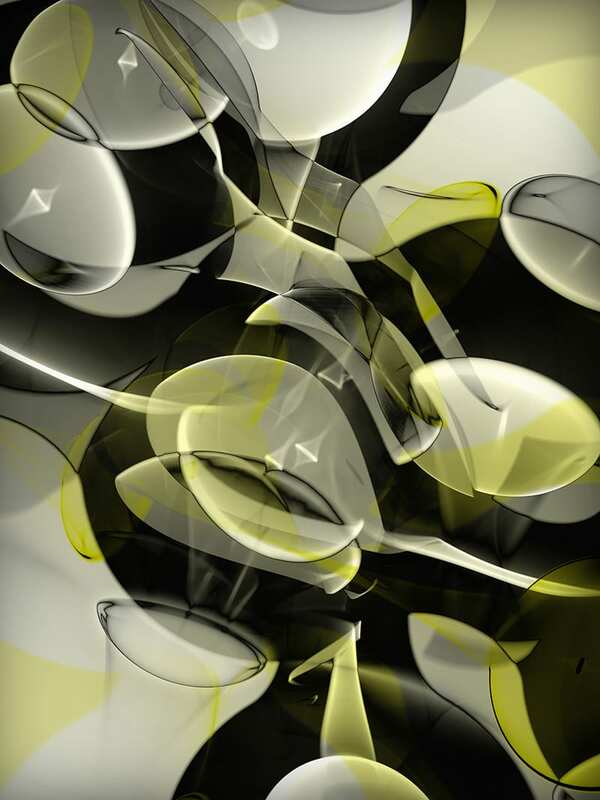 Non-stereoscopic images, such as ma.r.s.06 (2010) and ma.r.s.09 II (2013), are rich in surfaces that are unknown and exotic. The clarity is often so exact, it would not be unreasonable to think these images are staged or not landmasses at all, but perhaps a greatly magnified bacterial organism or other microscopic fare. Ruff’s color enhancements confuse us further. 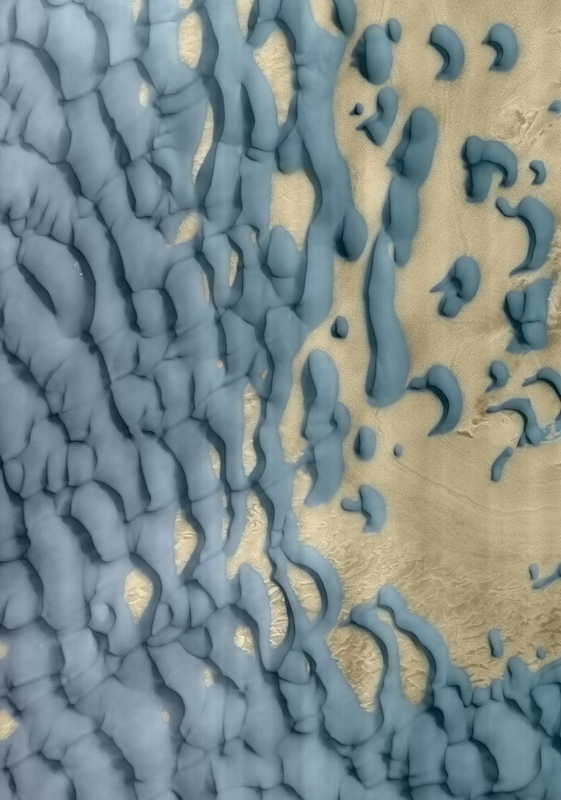 The Mars here is not red, but the hues present are optically and aesthetically pleasing.This is a new world, a place of slicked ethereal surfaces injected with the illusion of moisture or the rapid speed of motion. 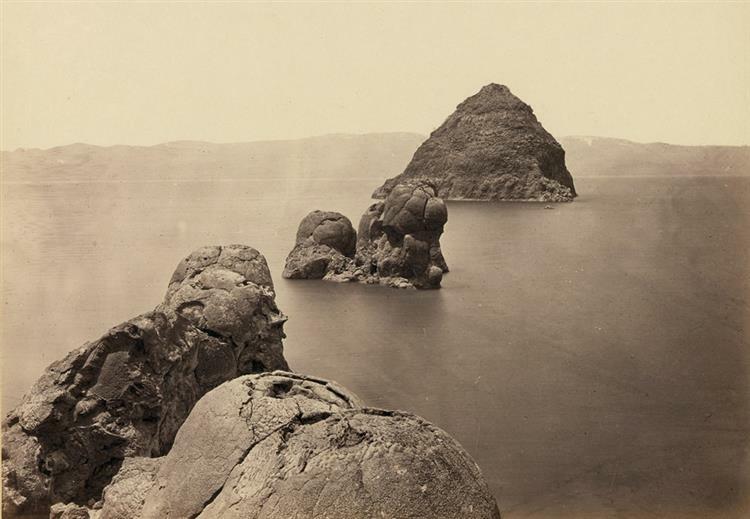 One may be reminded of early American survey photographs by the likes of Watkins and O’Sullivan. Like those nineteenth century mavericks, here is Ruff, a twenty-first century pioneer. He is changing how we think about our world – now part digital and virtual – through new and inventive possibilities for image making. The photograms are best when they are least inhibited, when control seems to have been lost to the machines that created them. 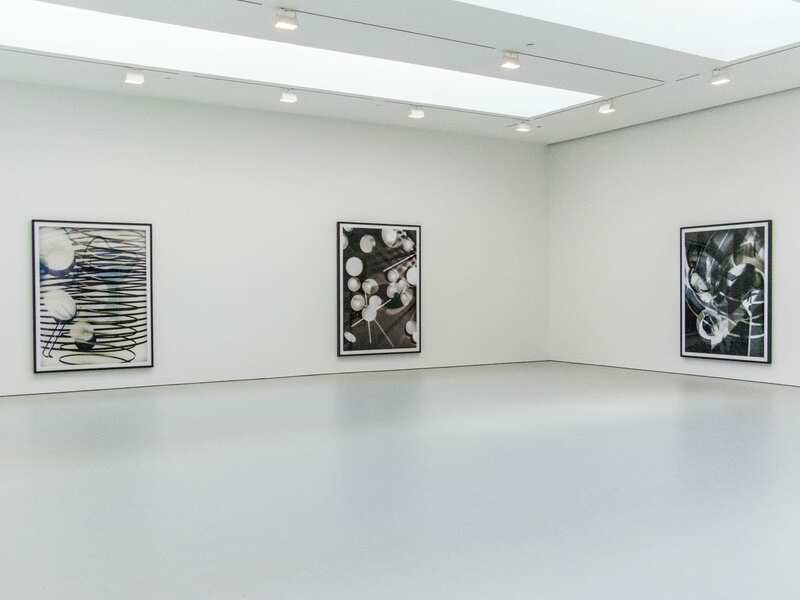 Simultaneously, the photograms in the exhibition are monumental displays of color, form and detail. Composed of varying squiggles, orbs, arcs, and rhythmic lines; they share the biomorphic aspects of ma.r.s. but also bring atomic associations into play. 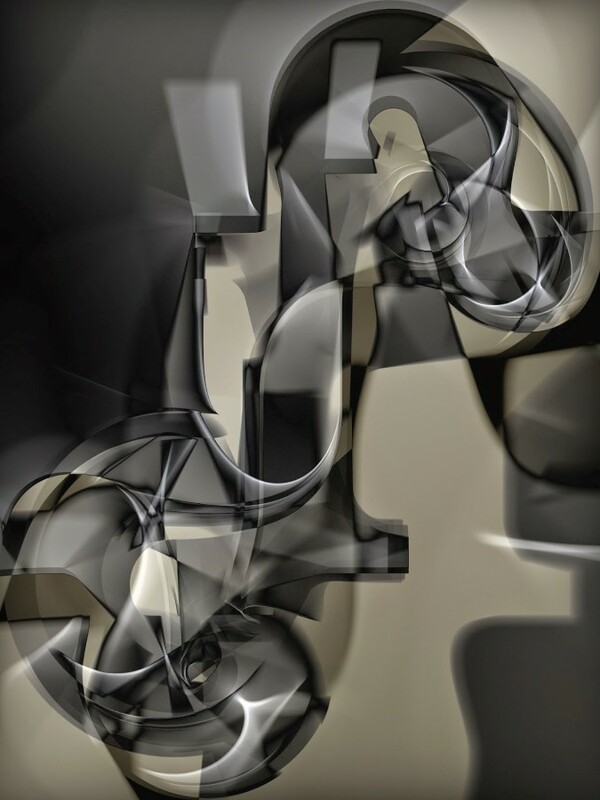 Ruff is indebted to twentieth century darkroom experimentations by Maholy-Nagy, Man Ray and Schad, but his technique relies on software that favors algorithms over a sleight of hand. There is complexity and maturity here that is not found in the analog precedents, though their merit is not being questioned. With Ruff, it is as if we are viewing the chaos of particles at a subatomic scale, millions of times larger and more terrifying, but also more beautiful. These visual ballets, like free radical atoms, feel fleeting, as if their chaos has been suspended in a frozen moment of calm for our viewing. The photograms are best when they are least inhibited, when control seems to have been lost to the machines that created them. Images like phg.04, r.phg.03 and r.phg.s.03 (all 2012), are matrices of chaotic interactions where the implied movements appear autonomous. Ruff’s earlier zycles images look like a prototype drawing for the finished photograms. In those works, arcs of organized color or “cycloids,” are the overlapping depictions of mathematical curves. James Clerk Maxwell’s nineteenth century treatise on electromagnetism and his engravings of magnetic fields, were sources of influence for that project. Likewise, Ruff’s cassini and Sterne images establish his longstanding interest in the cosmos, which ma.r.s. reiterates and also acts as an extension of. In a recent interview, Ruff spoke about his 1980s quote stating, “There have to be at least two copies of a photograph, otherwise it’s not a photograph.” A sentiment that has alarming acuity for his highly-varied projects and our evolving sense of the photographic medium. The prints for ma.r.s. 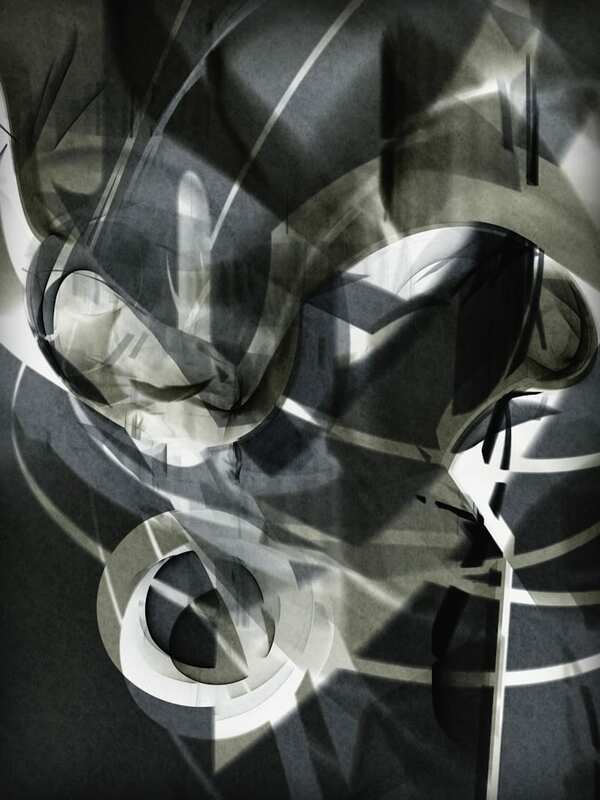 and photograms exist as multiples, as photographs, and are representative of expanding views on what photography is or can be in these exponential times. Vladimir Gintoff graduated from New York University’s Tisch School of the Arts in 2012 with degrees in Photography and Art History. 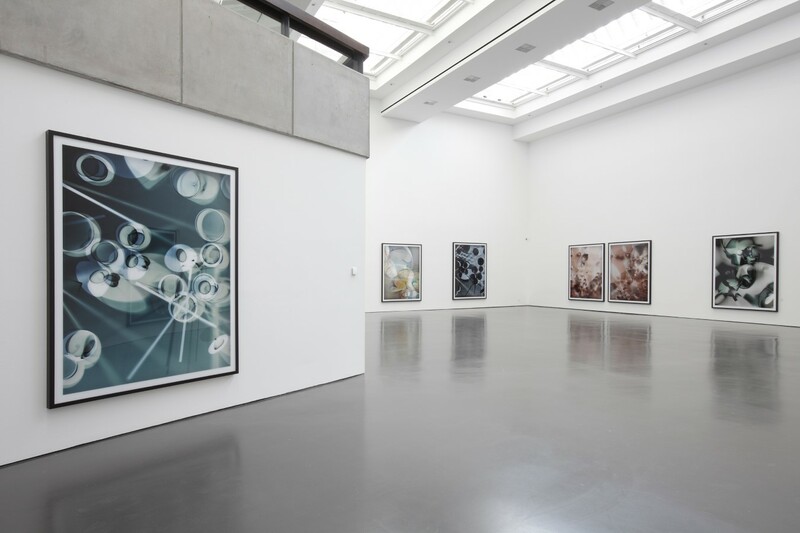 Posted in Exhibitions, Reviews and tagged David Zwirner, Düsseldorf School of Photography, Exhibition Review, German Artist, Germany, Manipulated Photography, New York City, Photograms, Photography, Thomas Ruff, Vladimir Gintoff.